Today is Halloween so I thought would write on a topic that gives me the creeps…. bed bugs. Infestations can be an issue that every property manager or owner of residential investment real estate may face. One June 9th Michigan House Bill 4719 was introduced – by Representative Brandt Iden -himself a Developer and Property Manager in South West Michigan. check out the text here – the Bill would amend the Michigan statute governing landlord tenant relationships to include addressing the control of certain pests – including bed bugs. 1. 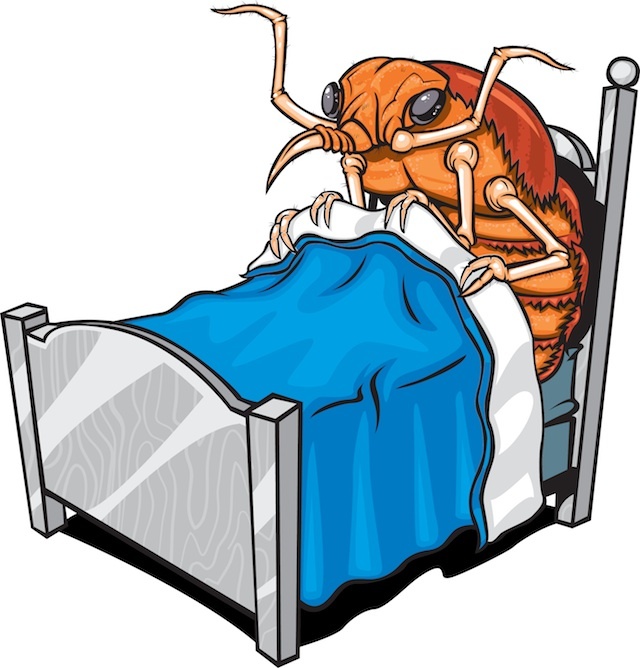 Mandates specifically that the Landlord is to keep the rental space free from bed bugs and provide educational literature about bed bug infestations to new tenants. within 7 days of confirming infestation, Landlord shall begin control and schedule inspections of adjoining rental units. 4. Limits damages against Landlord for infestations unless caused by Landlord’s Negligence. 3. Tenant shall notify Landlord within 2 days of notice of infestation. 4. Tenant responsible for damages due to bed bugs caused by Tenant, or guest. The bill was referred to the Committee on Law and Justice. This would provide some discretion among the parties to craft a resolution. Bedbug infestation is a problem. It can cause tenants problems, particularly in lower income housing. As reference, I would highly recommend reading Matthew Desmond’s book “Evicted” It is no secret that Michigan, particularly Kent County, is experiencing an Affordable Housing Crisis. Further, unhappy tenants who withhold rent can cause landlord problems that end up in court. This type of bill could provide clarity to landlords and tenants on their reciprocal duties and rights in such circumstances. It could also provide them flexibility to come up with a resolution to get rid of any infestations. Real Estate Law Update: Real Estate Investors Be Careful When Interacting with Occupants of Foreclosed Property. It is a rainy Monday afternoon. It has been dark all day long. I took this picture earlier today and the rain isn’t letting up. As a way to distract from the gloomy weather I thought it might be a good opportunity to share some of my thoughts about a court case that came out a few days ago involving a real estate investor, property manager, and a hold over occupant of property. This case illustrates ways that real estate investors and property managers can go wrong when dealing with occupants of foreclosed property. Anderson v Great Lakes Property and Investment, Inc.
“This case arises from defendants’ actions in removing plaintiff and his personal belongings from the rental property, on two occasions, without resort to summary proceedings in the court.” Id. page 1. In 2008 Plaintiff entered into a month-to-month lease with the property owner. Owner lost the property to a tax foreclosure in 2015. Real Estate Investor purchased the property at tax sale in the fall of 2015, and hired defendant Great Lakes to manage the property. After the purchase, Investor and Property Manager, sent a letter of ownership to all occupants of the property, including plaintiff, which gave plaintiff 10 days to vacate the property. Thereafter, defendant Great Lakes’s sole shareholder, defendant McMorris, came to plaintiff’s unit and demanded that he vacate within 3 days. When plaintiff did not vacate the premises, defendants came to the property on January 15, 2016, and removed plaintiff’s personal belongings from his unit. After defendants left, plaintiff returned to the property, purchased and installed a new lock on his door, repaired the door, and placed his personal belongings back into his unit. The next day, defendants returned and once again, removed plaintiff’s possession from the property. Plaintiff filed a six-count complaint against defendants for a violation of the anti-lockout statute. Id. Page 2. The Anti-Lockout statute provides damages for forcible ejectment from property or unlawful interference with a possessory interest in property. Subsection (1) (forcible ejection) applies to any person. Subsection (2) (unlawful interference) applies to any tenant in possession. Here, the District Court sided with the new Owner – basically holding that the Plaintiff was simply “a squatter”, entitling him to no rights or protections. Id. page 2. The Court of Appeals REVERSED! As the Court of Appeals noted, “[t]he Michigan anti-lockout statute, MCL 600.2918, “virtually eliminates the self-help remedy in Michigan in favor of judicial process to remove a tenant wrongfully in possession.” Id. Page 3 citing Deroshia v Union Terminal Piers, 151 Mich App 715, 719; 391 NW2d 458 (1986). The Court also held that “There is no statutory or caselaw definition of squatter.” Id. Page 4. The Court also questioned whether the Investor or its Manager gave proper notice to terminate. It was questionable whether the “Notice” mailed to each tenant satisfied the requirements to recover possession of property under Michigan law. MCL 554.134(1) – (holding that “[a] tenant is entitled to one month’s notice to quit in order to terminate a month-to month tenancy at will” Id. Page 4. In short – if you purchase property that is occupied, you need to properly use the court systems to remove tenants. To avoid any unfounded claims by holdovers, it always makes sense after purchasing property at foreclosure, when there are any occupants present, to go through the lawful channels for a court proceeding to extinguish any possessory rights and to make sure any personal belongings are handled appropriately. You don’t want to expose yourself to undue liability. Today, Keith A. Noreika, Acting Comptroller of the Currency gave remarks concerning Fintech Companies at Georgetown University’s Fintech Week. The prior OCC, Thomas Curry announced earlier this year that OCC would move forward with considering applications from financial technology (fintech) companies to become special purpose national banks. Fintech Charter: Praise, Debate, Criticism and a Lawsuit. The propriety of a Fintech charter has been supported by the Fintech community in general. rs as an “unprecedented, unlawful expansion of the chartering authority”- check out the Press Release from the CSBS back in April. The OCC’s present Stance on a Fintech Charter – a Work in Progress. It appears no action will be taken until at least the lawsuit is resolved. Business Law Update for LLCs: The Words You Use In Your Operating Agreement Matter. Good morning, all! Yesterday was a beautiful day, see the photo I took overlooking downtown Grand Rapids. The leaves are already changing color. Today I read a Court of Appeals Case that came out yesterday that provides a good example for business owners. Background – Today LLCs are generally the entity of choice. No double taxation (like in traditional C-Corporations). However, just forming the LLC by filing the articles of organization with the State of Michigan is not enough to fully protect your business. One fundamental document is your operating agreement. It is that document that spells out how the business affairs of the company are conducted. It also spells out the “exit” – in what event and on what terms can a member leave the company? I have often written about why your operating agreement matters. Today I read an unpublished court of appeals decision that provides another illustration on why not only having the operating agreement matters, but also the exact language in your operating agreement matters. Plaintiff Rhonda Keller, LNP and Defendant Kasandra Lechel, licensed nurse practitioners. They were the sole members of two LLCs – HealthWise was the “operating company” and NP Dreams owned the real estate used by HealthWise. The HealthWise Agreement had a “personal and professional standard of conduct” section that required a member to withdraw from the company if they violated the provision. Keller found out that Defendant Lechel had taken actions that she deemed should require Lechel to resign. Lechel did not resign and therefore Keller sued to compel withdrawal from the company. There were other claims and counter-claims made between the parties; however, the issue relevant for purposes of my article is regarding the buy-out provision in the Operating Agreement. The Operating Agreement required the Company to buy out a withdrawing member under certain terms. Plaintiff sued to expel Lechel, claiming she committed bad acts that required her removal. As such, Plaintiff should not be required to compensate her buy out. “With regard to the HealthWise and NP Dreams Agreements and compensation due to Lechel, the trial court held that “neither the buyout nor the liquidation option provides a logical and just resolution.” The court pointed to uncontroverted proofs that the corporate debts exceeded assets. Further, the trial court explained, because Lechel had breached the contract first, she was not entitled to recover on it. The trial court issued an order stating that Lechel “is not entitled to any compensation for her interests in the two Limited Liability companies.” Id. Page 4. Court of Appeals reversed on this issue. Law: Your Operating Agreement is a Contract. Courts will interpret a Contract in accordance with its plain meaning. “Our primary goal in interpreting a contract is to honor the intent of the parties by enforcing the plain and unambiguous language of the agreement. See Klapp v United Ins Group Agency, Inc, 468 Mich 459, 473; 663 NW2d 447 (2003); Defrain, 491 Mich at 367. Clear and unambiguous language will be enforced as written. Farmers Ins Exch v Kurzmann, 257 Mich App 412, 418; 668 NW2d 199 (2003). action as may be required to compel resignation under the same terms.” Section 5.2 lists the terms for voluntary withdrawal, including 2 options for compensating the withdrawing member: either (1) payment of 80% of the member’s share of the agreed-upon value of the company, which amounts to $40,000 to defendant.” Id. at Page 7. The Court’s language in its opinion is very telling. It was not going to apply “equity” since the parties were free to contract how they saw fit. “Despite testimony that HealthWise’s liabilities exceeded its assets, we see no reason to apply an equitable remedy when a contractual remedy is available. See Tkachik v Mandeville, 487 Mich 38, 45; 790 NW2d 260 (2010). Take care in drafting your operating agreement. If you desire a penalty in the event of termination of a membership interest – then make sure that language is included in your operating agreement. The courts will enforce clear language in an operating agreement. Thursday Thoughts: A Call to Living a More Fearless Life. This morning, as I do most every morning, I was reading a devotional by author and Pastor Tim Keller – I would recommend this devotional to anyone. This topic hit me today. If we are honest with ourselves, we all have moments where we are fearful. fear of the failing health of loved ones. I am sure I am missing several that could be added to this list. This morning’s devotional ended with the prayer below. I love roller coasters (this ties in, I promise). What I love about roller coasters – I know that I am fastened in tight – I am not worried about falling out. Because I believe I am secure, I am left simply to enjoy the ride (and feel like I’m a superhero). If I thought that I was really going to fall out – I am sure the ride would not be fun at all – but from start to finish – terrifying. There are many hardships that could cause me to panic. What am I fixing my eyes on? I am not my own. 1 Corinthians 6:20. Because of that, I will pray Tim Keller’s prayer and strive to live more fearlessly today. Real Estate Investors: In Your Efforts to Make a Profit Be Wary of Cutting Corners. Let me illustrate a picture for you: Let’s say you are a real estate investor. You show up for a foreclosure sale. There are several people present to bid on a specific piece of property. One of those guys winks at you, motions you to come over (in a clandestine sort of way). Red Flags should be going off to you by now. Unfortunately, the same red flags either did not go off or where intentionally ignored for the 63 or so individuals who were targeted for bid rigging at foreclosure sales by the Department of Justice. In today’s market, good deals for real estate investors are getting harder to come by. With distressed property becoming a scarce resource and competition ever increasing, some real estate investors have resorted to less than legal acts to boost their profit. Investors should know that the Department of Justice as well as State Agencies are cracking down on unfair real estate practices. Appenrodt pleaded guilty to two counts of bid rigging in U.S. District Court for the Northern District of California in San Francisco. Investigations Have Yielded 63 Plea Agreements to Date. In Michigan the record numbers of foreclosed properties since 2008 has provided a market (albeit one that is slowing down) for flipping residential real estate. With this opportunity to profit has also created an opportunity for abuse and fraud. The real estate legal landscape is complex enough, do yourselves a favor – follow the rules.